For t-shirts and other merchandise visit our Apparel shop on Spreadshirt. 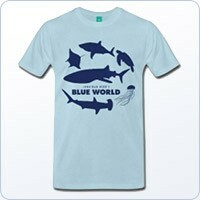 You can buy Apparel here. NEW! Season 4 DVD sets! 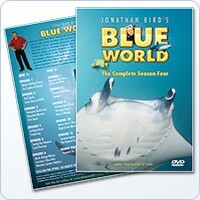 This 2 disc set includes all 11 television episodes from the fourth season plus a bonus feature Beneath the Surface, an insightful look at the team behind Jonathan Bird's Blue World, as told by the team themselves. The DVD set includes 2 discs, is enhanced for widescreen TVs in anamorphic 16:9. It is also our first DVD set with closed captioning for the hearing impared. $24.95 each plus shipping. Please note: We have a small staff and orders can go a week or more before they are shipped if we are on a shoot. Season 3 DVD sets! 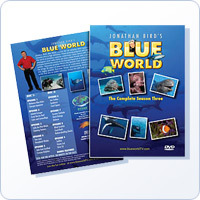 This set includes all 9 television episodes from the third season plus bonus features including Behind the Blue World, a funny behind-the-scenes look at the production of the program. The DVD set includes 2 discs and is enhanced for widescreen TVs in anamorphic 16:9. (That means if you have a widescreen TV, it fills the whole screen, but if you have an older 4:3 set, it will be letterboxed). $24.95 each plus shipping. Please note: We have a small staff and orders can go a week or more before they are shipped if we are on a shoot. Season 2 DVD sets! 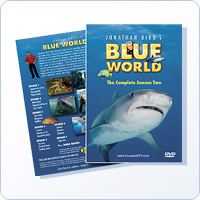 This set includes all 7 television episodes from the second season plus a bonus feature (Sharks: Predators With A Purpose produced by Oceanic Research Group). 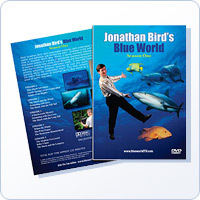 The DVD set includes 2 discs and is enhanced for widescreen TVs in anamorphic 16:9. (That means if you have a widescreen TV, it fills the whole screen, but if you have an older 4:3 set, it will be letterboxed). $24.95 each plus shipping. Please note: We have a small staff and orders can go a week or more before they are shipped if we are on a shoot. The season that started it all! This DVD contains all 15 season 1 webisodes (150 minutes, 5 half-hour TV episodes). Adventures with Sharks! In this exciting photographic journey, Jonathan shares his adventures and discoveries photographing sharks around the world. 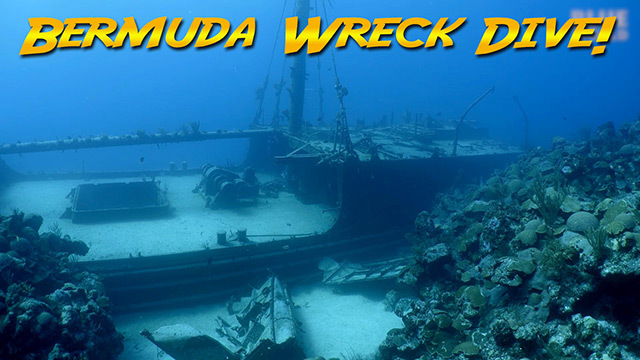 From the aggressive Gray Reef sharks of the tropical Pacific to the shy and elusive Basking sharks of the frigid Bay of Fundy, Jonathan details the thrills, dangers and disappointments of working with wild sharks in the open ocean. 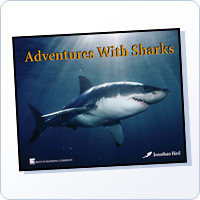 Accompanied by more than one hundred vivid color photographs, Adventures With Sharks is an uncommonly fun-to-read mixture of science, adventure and stunning photographs. 144 pages, hard cover on glossy stock. We bought a huge order of these from the publisher so we can sell it very affordably! Only $12.99 plus shipping. (Please note international shipping is extremely expensive on books because they are heavy). More of Jonathan’s books are available on his website. Please note, we are not Amazon! Most people only order directly from us if they want something signed. If you want it fast, order it from Amazon. Signed or not, our orders often don't get shipped for a week or more because we have a small staff and we travel frequently. If you need a signed book or DVD for a birthday, please plan ahead!